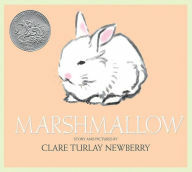 Storyline: One day, Miss Tilly – the owner of a cat called Oliver – brings home a baby bunny which she names Marshmallow. When she shows Oliver the new pet, the cat, who had never seen another animal except for one stuffed rabbit, steps back frightened. But little by little, Oliver became curious and it even looks like he was stalking the little bunny, “his eyes glaring wickedly”. But Miss Tilly is watching and as soon as she sees it, she separates the two pets, putting Marshmallow in her bedroom, for safety. So, the days and weeks pass. The bunny grows up, he is happy, plays a lot and eats a lot, even books, furniture and rugs. One day, as the owner is late to come home, Oliver hears a loud noise coming from Miss Tilly’s bedroom. So he sets up to find out what’s going on in there. The cat is clever and manages to turn the door knob and open it. Then he sees the rabbit playing with much enthusiasms, skidding on the floor and jumping on things. Oliver creeps inside but Marshmallow is not afraid of the cat. More, he thinks that the big stripped animal may be his mother who he was missing badly. He comes to Oliver and tries to engage him on his play. At first, Oliver is confused but little by little he starts playing much to bunny’s delight. When Miss Tilly came home she found them asleep, curled together on the floor. And from that they, Marshmallow and Oliver become inseparable. Marshmallow is a sweet story about a bunny and a cat that develop, at last, a great friendship. I should also mention that Miss Tilly is a writer and she writes nice poems about her bunny. Very cute! Illustration: This book is also illustrated by the author, Clare Turlay Newberry. The illustration is extremely simple: there is only the cat and the bunny. Each page has the two animals, depicted in the state described in that particular time in the story. Once in a while, she supports her drawing with props like a piece a furniture or a dog food bowl. The pictures are black and white with fainted shades of pink.